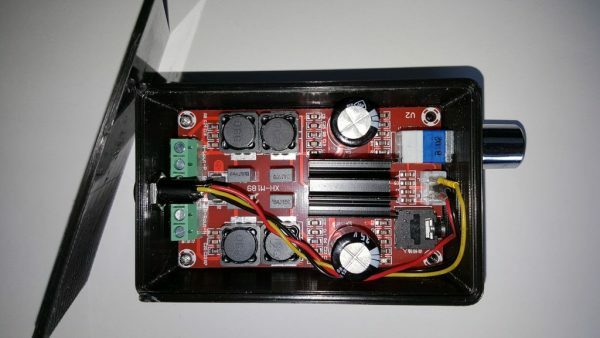 TPA3116 Power Amp case #3DThursday #3DPrinting « Adafruit Industries – Makers, hackers, artists, designers and engineers! This is a small enclosure to hold one of the common small TPA3116 power amplifier modules available on ebay. THese come in various formats. I use one with small footprint. See picture to match against eBay types. It has a sliding lid to give access to screwing in power and loudspeaker connections through access holes. The OpenSCAD file has options for the audio input openings. Either a front access for the on board jack plug or rear panel for linking through to on board jumpers; or both. The rear one can be positioned in the centre or off to the side. The side position avoids it getting in the way of the screw holes.